Can you tell a good wine from a bad one? So many of us go out of our way to educate ourselves about food. We watch online tutorials, read articles and research recipes, but can the same dedication to learning be said about wine enthusiasts? If you’re living in London and want to learn more about the intricacies of wine, read on to discover which school and wine certification is the best for you. People who are deeply passionate about wine and gastronomy often want to work professionally in the field. To do this, a deep knowledge and understanding of wine and the industry is needed. A wine diploma is one the best qualifications you can have if a career in the hospitality industry is on the horizon. In London, most aspiring wine connoisseurs will choose to study for their wine diploma at either Le Cordon Bleu or Wine and Spirit Education Trust (WSET), but what are the differences between the courses? And which is the stronger professional qualification? Our full-time level 4 Diploma in Wine, Gastronomy and Management is designed to provide students with an in-depth knowledge of wine and gastronomy industries. Geared towards those who wish to work in the industry, students will learn about wine sensory analysis, wine production and business management. Drawing from the expertise of Le Cordon Bleu Master Chefs and cheese expert, students will have the opportunity to gain in-depth knowledge in food and wine pairing with both theoretical and practical understanding. Students are also taught to develop a structured method to assess alcoholic and non-alcoholic beverages (eg. tea, coffee, spirits etc.) that can be offered as an alternative to wine. In addition to classroom studies, Le Cordon Bleu places a huge importance on practical, hands-on learning. During the term, students will be able to visit, wineries, breweries, distilleries and Michelin-starred restaurants. All our teachers are wine experts who’ve worked extensively in the industry and offer students expert knowledge and guidance. Because of our small class sizes, students and teachers have a great working relationship and can easily build a rapport with one another. Small class sizes and our highly-trained teachers mean that lessons are consistently packed with insight and interaction. Students who want to focus one particular area can easily do so as our teachers pride themselves on being mentors to students and will happily advise and guide them in their careers. Studying at Le Cordon Bleu London offers students numerous networking opportunities, as they will attend numerous trade fairs and tastings throughout their time at the school. These events allow them to meet influential people in the industry and create valuable contacts. The course lasts six months or 480 hours (with an additional 400 hours of study time also expected) and is broken up into two three-month semester blocks. The programme terms can also be studied non-consecutively. On average students will have 22 hours per week of study at Le Cordon Bleu. The total cost of this professional wine certification course is £12,500. The fees include uniforms, learning materials, the field trips and tastings, subscription to Jancis Robinson's Purple Pages, and a personal licence course. The wine diploma is the WSET school’s flagship course and was created to provide students with an in-depth knowledge of wine and spirit production*. Throughout the course students will cover topics including wine and spirit production, wine regions and styles, and the global trade in wines. WSET’s diploma is considered a stepping stone to the Master of Wine qualification, which is regarded as one of the highest standards of knowledge within the wine industry. Upon successful completion of the diploma, students will receive a WSET certificate, a lapel pin and a may use the post-nominal DipWSET and associated certified logo. Students who wish to study for a WSET diploma must either hold a WSET Level 3 in Wines and Spirits, a Level 3 award in wines or an equivalent qualification to enrol. *From the 1st of August 2019, the spirits section of this course will be removed, and the diploma will be renamed WSET Level 4 Diploma in Wines. 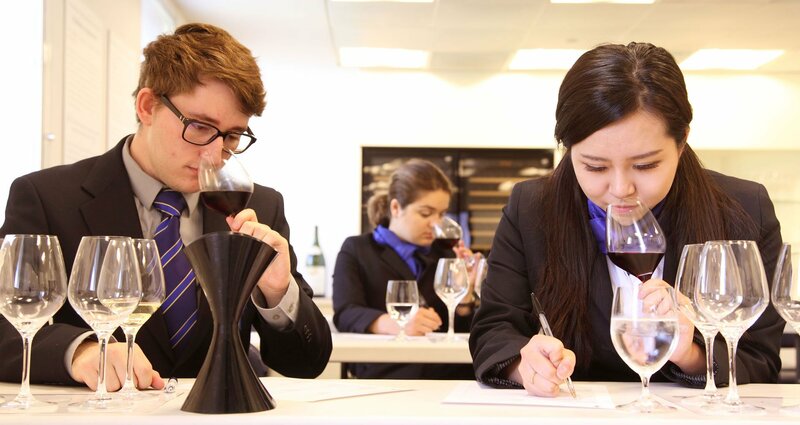 One of the advantages of studying at WSET is the level of flexibility students enjoy with their study. In total, students must complete 118 hours of classroom or online delivery time, as well as a minimum of 600 hours of study time. These hours can be broken up in a variety of different ways to suit students who wish to study fulltime or combine part-time work and study. Students can choose to break the Diploma course into two semesters, which can be completed over two academic years, and study one day or five days a week. This system allows students to spread the financial cost over two years rather than one lump sum at the start of the course. Additionally, students can choose to attend classes in the evenings or only on Fridays or Saturdays. There’s also an online version of the diploma which is flexible to work around your existing commitments. The online diploma covers the same syllabus as the classroom course, so you won’t be missing out on anything. WSET’s online classroom allows you to study alongside your peers under the guidance of a teacher. The guide price for WSET’s diploma is £3,225.00, however this can change depending on your location and course delivery option. The price includes tuition, Online Classroom support, wine and spirit samples, study packs, the WSET Level 4 Systematic Approach to Tasting Wine, the Oxford Companion to Wine and all examination fees. Students would be susceptible to additional fees if they have to repeat or transfer classes, starting from £25 per hour. Which Wine Certification is For You? Before deciding on the school or course, establish exactly what it is you want to achieve. By doing this you’ll be better able to find the course to suit your needs. Do you simply want to improve your knowledge of wine in a flexible learning environment? If so, WSET is the school for you. However, if you want to work and excel in the hospitality or wine industry, study under world-class teachers and intern in some of the UK’s best restaurants, wine merchants, importers, retailers etc. then Le Cordon Bleu should be your first choice. To learn more about Le Cordon Bleu’s wide range of wine courses, contact us today.